Professor Raymond Kern passed away on November 6th 2014, after losing his last battle against several cancers. The Science of Crystal Growth has probably lost one of its best leaders, but Kern’s rich personality is what we will miss most. With an academic background in chemistry, he began his scientific studies in 1949 at Strasbourg Crystallography and Mineralogy Laboratory (LMC) where he submitted his PhD in Sciences in 1953 on ionic crystal habits growing in solution. Emphasis was on the role of supersaturation and additives on the morphological changes of alkaly halides crystals. Then he joined the LMC of Paris-Sorbonne, which was at that time directed by Jean Wyart. There, he met Hubert Curien with whom he worked on a crystal theory of twins. There again, Raymond Kern adopted the vector processing on crystallography, which remained the « signature look » of his teachings all along his career. In 1959, he was appointed Professor of Mineralogy-Crystallography at Nancy, where he founded his first laboratory. There, he extended the topic from solution growth to germination, and deepened the key role of absorption phenomena on crystal surfaces. Thanks to regular educational interactions with the Ecole Nationale Supérieure de Géologie (ENSG) of Nancy, a work entitled “Basic Thermodynamics for Mineralogists, Petrographists and geologists” was published in 1964 by Masson & Cie, written by Alain Weisbrod and himself. It remained a reference book for decades. Another result of his collaborations with the ENSG with Boyan Mutaftchiev (on absorption events and wetting properties) led to a better understanding and an improvement of ore treatment devices by flotation process. Raymond Kern was appointed on Jean Royer Chair at Marseille in 1966, discoverer of epitaxy phenomenon between crystals. There, he founded the Research Centre on Crystal Growth Mecanism (CRMC2-CNRS, now CINaM), which embraced the « golden age » of crystal growth in France. Physicists, chemists, biologists and mineralogists worked together to explore all the facets of Crystal Growth Science, including its industrial and medical use. Among others, experiments on crystal germination and growth, on epitaxial germination or of absorption/desorption of crystal surfaces were led on materials as diverse as proteins, paraffin, phyllosilicates, metal alloys, kidney stones or thin films of semiconductors. 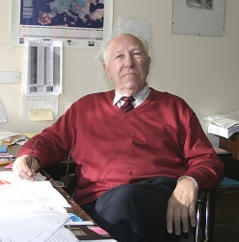 The international reputation of CRMC2 encouraged Raymond Kern to co-founding the first international journal dedicated to crystal growth, untitled « journal of Crystal Growth ». He always kept a real interest in crystal science, working until his last months on elastic constraints phenomena concerning crystal surface steps. Raymond Kern also had the exceptional qualities of a “builder” in sciences; he had a very strong personality. Nobody could be neutral with him: one could only either appreciate him or hate him. His office door was always open if someone wanted to share scientific or personnel problems, in either case, he always tried to help. He liked classical music, literature, gardening and good food, which he shared with us when he was still in good health, but he never watched TV and hated computers until the end. Raymond Kern will leave unforgettable memories with many of us, either linked with science or fascinated by exceptional individuals.